Let’s talk deets! These shadows are .12oz (same size as SUGARPILL, SAUCEBOX etc). They’re currently on sale for $5 each (reg. $5.50) which is utter insanity. As if that weren’t enough, there’s also a bundle- all 10 shadows plus her brand new magnetic palette (which is bomb af!) for $55! Which is basically like getting the palette for free and we all know they’re not cheap. A few people have asked me about ingredients. I’m not certain where or if they’re located on the website but they are on the packaging. There’s no parabens or mineral oil which seem to be the two biggest concerns for people. And of course JUVIA’S PLACE is cruelty free! I’ve never heard of any indie brand testing on animals. 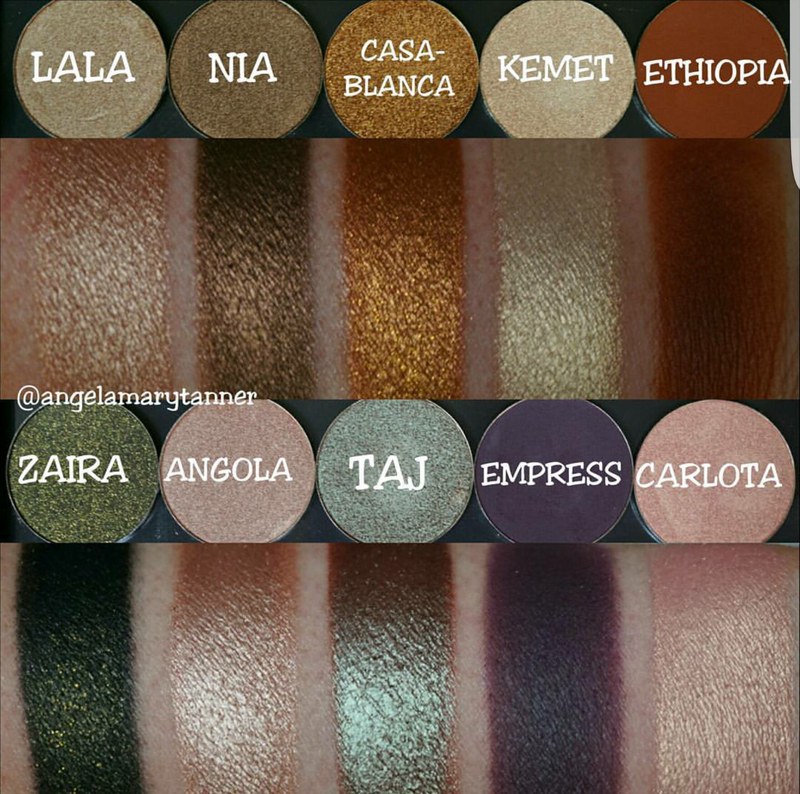 In this set of 10, there’s 2 mattes (ETHIOPIA and EMPRESS), a matte with glitter (ZAIRA), 3 duochromes (TAJ, CARLOTA and KEMET) and 4 metallics (LALA, NIA, CASABLANCA and ANGOLA). The shimmery shades have a dense texture like you’d associate with a ‘foiled’ shadow. The mattes are really nice. Especially EMPRESS! Do you know how hard it is to swatch matte purple shadows?? It’s friggin hard. Even the really high quality ones tend to go on patchy. This one swatches beautifully and performs just as well on the eyes. Of course I like all of them but if I had to narrow it down, I’d say my favs are CARLOTA, ANGOLA, EMPRESS and ETHIOPIA. Oh and I really KEMET too. That’s based on my personal color preference as the formula is consistent in all 10 shades. I’d definitely recommend checking out this brand if you haven’t already. Not only are products beautiful, they’re an excellent value and it’s a female owned small business.